Indians know exactly what a masala dabba is and what to do with it. You’ve seen your maa and grandmas using them your whole life. For those outside of the Indian culture, we have to start with the basics. It’s the Indian version of a spice rack – only cooler! They’re usually fancy looking, either in a stainless steel disk or a wooden box. What you put in it depends on what types of Indian dishes you cook the most. All right, you can use a masala dabba for your spices even if you don’t know how to cook Indian food, but we’re talking about doing it the right way…tradition and stuff. Traditionally, you’ll put seven different spices in your masala dabba. Inside of the stainless steel disk or wooden box are seven small dishes; usually tiny bowls with teaspoons for each spice. A traditional masala dabba or Indian spice box is stainless steel and flat with a tight fitting lid. It can be between 6” and 12” in diameter. Some masala dabba boxes come with a teaspoon for each spice while some just have one teaspoon for them all. First on our list doesn’t look like a traditional Masala Dabba spice box, but it is. The Masala Dabba Lock Spice Rack from Naaz Wood Arts is packaged in a handcrafted wood box made of sheesham wood and perfect for gift giving, no matter the occasion. Compared to traditional Masala Dabba, this is a much bigger rack. It is 8 inches long by 8 inches wide and holds 9 different spices. There is only one spice spoon and the box is very lightweight, made with eco-friendly wood. The box design is made to look like an antique. The style is a shout out to indigenous Indian culture. 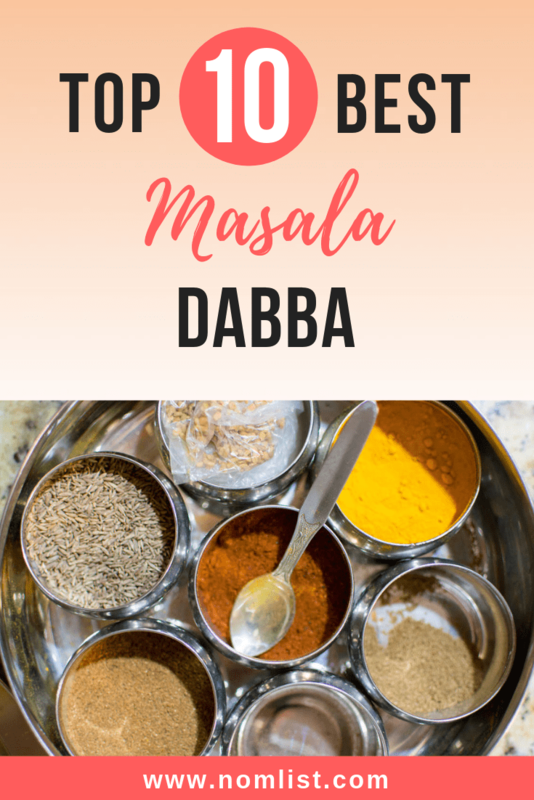 Whether you are Indian, have Indian friends, love Indian food, or just love to cook, this Masala Dabba is a great tool to have in the kitchen. You’re supposed to fill it with Indian spices but it works for any fine spice for cooks of all kinds! Next is the Handmade Masala Dabba Lock Spice Rack from Affaires. This box is also a gift box and utility spice rack. It also has more than the typical number of spices. Traditional Masala Dabbas contain 7 spice dishes – this one has 9. Each cubed spice container is about 2.25 inches deep so it can hold a lot of spices. Of course, remember not to overfill it. You don’t want to put spices in a Masala Dabba and let them sit for a year. You’re supposed to fill it so that you use it up in a month or two. Made of sheesham wood, this spice box is designed to look authentically antique with a simple casual design. It is made of eco-friendly wood and is very easy to clean. The glass cover keeps spices dry and helps to keep them fresh. Your ma’s Masala Dabba may look something like this. The Large Wooden Masala Dabba Spice Box from Indian Glance is a throwback to ancient Indian Masalas with its handcrafted floral carvings to give it a beautifully rustic look. The size of the box is more in line with traditional Masala Dabbas at six inches in diameter and 3.5 inches tall. The wood itself is made from a blend of rosewood and timber. There are only four spice compartments inside the box so this is basically to hold your top four go-to spices. One of the things we love the most about this Masala Dabba is that it is both decorative and functional. It looks a lot better sitting out on the kitchen counter than a plastic bottle of spices along a spice rack. Crafted in India by some of the finest wood artisans in the world, this Masala Dabba wonderfully blends elegance and tradition. Although we listed the Masala Dabba Spice Container from Tanish Trading #4, at first glance we fell in love with this thing. This is what a genuine Masala Dabba looks like. It’s made of stainless steel, holds seven different spices, and comes with a spice spoon and a seal tight lid. It’s first and foremost visually appealing with its simplistic yet modern design. There is no need for a lot of embellishment because the container is gorgeous enough. Inside are seven stainless steel cups that fit perfectly inside of the Masala Dabba along with the spice spoon. Best of all, the steel interior lid helps keep the container airtight so that no water or moisture gets in and ruins the spices. The container itself stands about three inches high so the cups inside are pretty deep and it is 8 inches in diameter; just the right size for a month or two of cooking! Another one of our favorites is the lovely handcrafted Masala Dabba Lock Spice Rack from Crafts’man. Made of high quality sheesham, the wood almost looks stained which adds to its good looks. You have a standard 8 inch by 8 inch box with the bonus 9 spice containers (2 more than with traditional Masalas). The cubed containers are only about two inches deep so even though you have 9 spices to fill it with, it doesn’t hold a lot of each – which is great, that’s what you want in a Masala Dabba! Generally we prefer the stainless steel spoons but of course, we give a pass on this one since the wooden spoon just looks so good with this box. It’s easy to maintain this spice box. All you need is a wet cloth to wipe it out from time to time – we say probably once a month. It has a glass lid cover that helps you keep the contents dry and is visually appealing; an excellent addition to your kitchen décor! We also found this Stainless Steel Masala Dabba Spice Container from Starnk very attractive. It’s quite similar to the Tarnish Masala because like that one, this one is very authentic looking. It is made of stainless steel as traditional Masalas are supposed to be. There are seven stainless steel cups inside of the masala to hold different spices. It also comes with an inner lid made of stainless steel to keep the contents inside airtight and free from moisture. The makers of this product make a special point to note that spices are not included – but you already knew that! This container only weighs about five ounces and is six inches in diameter. The cups are about 2.5 inches deep so it holds just the right amount of spices. For simple charm and pizzazz, we like this Masala Dabba. When we saw the Stainless Steel Airtight Masala Dabba from Storite, we thought, ‘How pretty?’ It’s not super fancy, and is not much different from most other traditional Masalas but presentation is very important. Plus we love that this one comes with its own tiny stainless steel measuring spoon – it’s the little things in life! Inside are seven stainless steel containers that are about five centimeters deep and the container itself is a little over 20 centimeters in diameter. There is also a double stainless steel lid so that your spices stay fresh and dry. This Masala was made in India and crafted to look authentically Indian. Using the highest quality stainless steel, this container really has that wow factor because of its brilliant shine, which is why it’s one of our favorites! It may not be ultra fancy or even stylish but what we love about the Stainless Steel Masala Dabba from USA with Love is its simplicity. It is designed to get right to the point – here is a box with seven tins in it, fill them with spices. Still, they don’t skimp on quality. This is really sturdy stainless steel. With wood, you can get spices stuck into the grain and it may never look really clean after so long. But with this stainless steel Masala Dabba, you just take out the tins and wash the whole thing or pop it in the dishwasher. The biggest downside to this one is that it doesn’t have the double steel lid. Now, the truth is, you don’t need the double lid to keep spices dry (you just have to be extra careful around water – when you’re cooking?). But it is nice to have when you are spinning around in a busy kitchen. Spectrahut also sells a Sheesham Wood Masala Dabba with a glass lid. As you can see, it’s very similar to some of the gift boxes we’ve seen. Made of sheesham wood, this box has been stained to create a warm honey brown box with matching wooden spice spoon. This box also comes with 9 cubed containers to hold spices and is larger than traditional Masalas. It is 8 inches by 8 inches and each container is about two and a quarter inches deep. Water is the enemy of a wooden Masala so keeping it away from water is very important, despite the glass lid. You’ll want to store this box out of the way of popping grease or boiling water. But you should put it somewhere in the kitchen where it can be seen – it is really a handsome Masala Dabba! Last but certainly not least, we pick the Stainless Steel Masala Dabba from Tabakh. We LOVE this one because of the way it looks. This is a little more modern than the traditional stainless steel Masala Dabbas that we’ve seen. You have the traditional seven containers but it also comes with seven spoons for each spice – we love that! But what you will find that we didn’t see in any of the others is a crystal finish glass lid for a steel Masala Dabba. It makes it look so sleek and stylish! When you receive this one, there is a protective screen on the glass lid. Take it off and this is just a gorgeous accent to your kitchen plus it’s very handy to have. The downside (there has to be a downside right? ); no double steel lid. But that’s okay, it closes tight, just don’t drop it in water! India’s Original Masala Chai Tea from VAHDAM® is a one pound bag of spiced chai tea made up of a blend of black tea, cinnamon, cardamom, cloves, and black pepper. Based on ancient tea blends, this bag makes over 200 cups. Filled with loose spice leaves that are vacuum sealed within three days after harvesting, the aroma really packs a wallop and the high caffeine content will give you the morning jolt you need from your chai latte. VAHDAM® also sells VAHDAM® Teas Double Spice – a double dose of chai tea spices. This brew is very strong containing double the spices of their Original Masala Chai Loose Leaf Tea. There are no added flavors; it is 100% all natural assam black tea that packs a powerful blend of fresh black pepper corns, cardamom, cinnamon, and cloves. VAHDAM® Teas Himalayan White Tea is said to be the “World’s Healthiest Tea Type.” By all measures, it probably is. Tea is healthy because of its anti-oxidant qualities. Well this white tea blend combines all of the teas with the highest amount of anti-oxidants, including green tea, black tea, and oolong. The loose leaves create an amazingly rich floral aroma that will charm the senses and give a boost to your day.